Often tagged as the isolated islands of India, Andaman Tour is meant for connoisseurs of travelling who are in search of exclusivity. The actual exploration of Andaman begins when one lands in Port Blair, the capital and the gateway point to the floating isles of Andamans. Covered with dense forests, Andaman Tour is blessed with immaculate natural bounties including sandy beaches, glimmering sands, aqua sea blues, marine life, coral reefs and mangrove-lined creeks. The must visit destination in the isles of Andaman, Havelock is renowned for its world-class beaches, laid-back vibe and a great place for scuba diving. India's best kept secret, Andaman can be explored more through sea excursions including snorkeling, trekking, island camping, fishing and scuba diving. 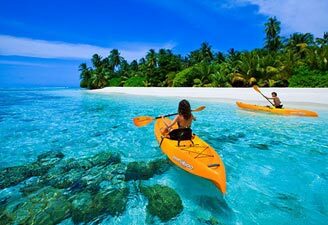 Surrounded by the immaculate wonders, Andaman Tour is a great way to rejoice the humanly existence. Full day tour of the North Bay Island offering exotic coral and marine life. The crystal clear water and virgin beaches are ideal for snorkeling and diving. Havelock to Port Blair, by motor-boat Return to Port Blair.